Thiophenes and phenylacetylenes, decorated with 1-methylindol-2-yl, 1,3,2-benzodiazaborol-2-yl, 1,3,2-diazaborol-2-yl, or 1,3,2-diazaborolidinyl groups at one end and dimesitylborolyl or CN substituents at the opposite end of the molecules, were synthesized. Upon UV irradiation, these push-pull systems in THF solution gave rise to bright-blue emission with Stokes shifts ranging from 4100 to 9300 cm–1 and quantum efficiencies up to 0.99. 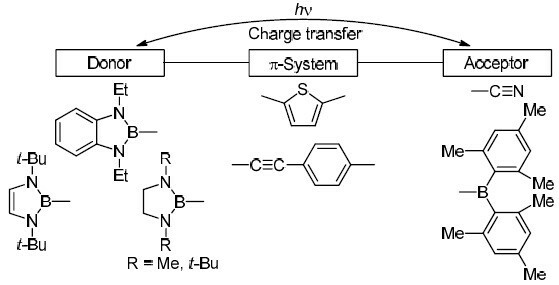 Thereby intramolecular charge transfer took place from the HOMO of the indolyl or borolyl fluorophores to the LUMO, mainly centered on the electron-withdrawing cyano or dimesitylboranyl group. 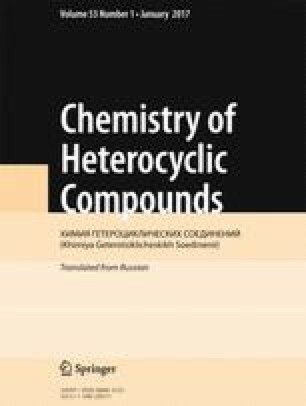 The online version of this article (doi: 10.1007/s10593-017-2021-0) contains supplementary material, which is available to authorized users.